The book “Experiencing Healing Prayer” was written out of Rick Richardson’s experience as an Anglican priest helping people find healing for the soul. Rick’s own personal journey in inner healing started when he told a friend about a recurring dream about a man coming at him with a knife. His friend suggested that they pray about Rick’s relationship with the gentleman in his dream. When they did this, Rick experienced “the healing touch of God and the blazing light of his wisdom” (page 13). That day marked a turning moment in Rick’s life as it was the start of a journey helping others experiences the healing power of Jesus. The book’s seventeen chapters can be broken into seven major sections with each part focused on a different subtopic of soul healing. The first section (Ch. 1-3) serves as an introduction to inner soul healing. From there the remaining chapters are split among the six signposts Rick proposes as guides “along the way on the healing journey” (page 33). The first signpost or second selection of the book (Ch. 4-6) is focused on God’s presence and hearing “God’s still small voice” (page 46). The third selection (Ch. 7) talks about gender identity and replaying our “diseased images and memoires” with “healed and transformed images” (page 89). Chapters 8-9 make up the fourth selection or third signpost with an emphasis renouncing unreal identities and embracing an identity rooted in Jesus. The fifth selection (Ch. 10-14) tries to get to the “roots of pain and problems, not just the fruits or symptoms” (page 12). This is quickly followed by the sixth selection (Ch. 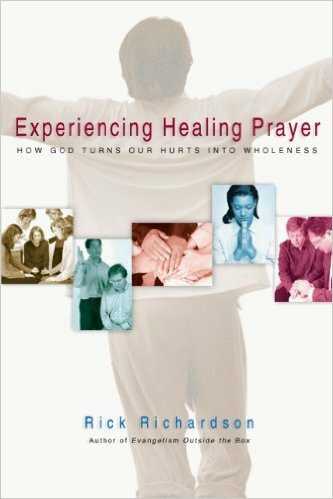 15) which talks about the “physical and sacramental means God has given as channels of healing power” (page 178). The last selection and the sixth signpost proposed by Rick is covered in chapters 16-17 and deals with giving away the healing received from God. Overall I agree with Rick and the six signposts he proposed. Learning to recognize the presence of God and allowing him to transform the imagines we have about ourselves and others is very important. All too often people pray a simple prayer of salvation without recognizing that the decision to follow Jesus is an “exchange of sovereignties” in which we move from the kingdom of darkness into the Kingdom of God (Williams 2006, 15). This sovereignty exchanged requires that our minds, hearts, bodies, and desires be transformed into those of Jesus. As St. Paul told the church in Ephesus, we are to “put of [our] old self, which is being corrupted by its deceitful desires; to be made new in the attitude of [our] minds; and to put on the new self, created to be like God in true righteousness and holiness” (Ephesians 4:22-24, NIV). There was one point of disagreement I had with Rick. In chapter two, he defines healing as the “transformation of the person into a truer and more whole follower, worshiper and lover of God” (page 27). This definition leaves a lot to be desired as it effectively spiritualizes the healing message of Jesus. Gone is the concept that healing brings physical pain relief or restores the wholeness to a person. Rather, healing under Rick’s definition becomes akin to sanctification in that it deals primary with the transformation of believers into the image of Jesus. By defining healing as a spiritual transformation, Rick dodges the issue of why some people are physically healed and others are not. Since spiritual transformation happens on the inside rather than the outside like physical healing, there less risk in offering healing as one can claim that it is a lifelong process. Rick states on page 30 that he does not make a “sharp distinction” between physical and inner healing and that there are times when “inside-out healing” will “affects people in very physical ways.” While this caveat is nice, it is noteworthy that physical healing is not mentioned again in the book nor do the six healing signposts proposed by Rick allow for people to experience physical healing separate from inner healing. This limitation of the healing message of Jesus clearly shows Rick’s biases and reaction against the healing models he experienced (pages 21-23). Rick’s spiritualization of healing can also be seen through the stories he chooses to use from Jesus’ ministry (pages 26-30). According to Rick, the primary reason why Jesus healed the man born blind in John 9 and the hemorrhaging women in Mark 5 was to get them to worship him. Why I’m sure Jesus wanted them to follow him, this is a poor treatment of Scriptures as there are other stories about people who did not choose to follow Jesus after their physical problems were healed. The story of the ten men with leprosy in Luke 17 is a prime example of Jesus healing people without all of them becoming worshipers of God. Rather than holding physical healing hostage for only those people who follow him, Jesus freely offered healing to everyone he met. The definition of healing I would like to propose is from Alexander Venter’s book “Doing Healing.” This definition states that “healing is the event and/or process of restoring wholeness to the whole person” (Venter 2009, 55). While this definition has some overlap with Rick’s definition, Venter’s view of healing places the focus on God bringing wholeness to a person regardless of whether or not they choose to follow him. God, in his great love and mercy, does not hold healing hostage for only those who follow him. Rather he gracefully holds out physical and emotional healing to people across the spectrum of life. Accordingly, we, the followers of Jesus, are to go out to every nook and cranny of the world declaring that God’s kingdom has come while demonstrating it through healing the sick regardless of their belief system. We have to trust that God will use our obedience to draw people to himself, offering them complete wholeness through an exchange of sovereignties that will last a lifetime. Richardson, Rick. 2005. Experiencing Healing Prayer: How God Turns Our Hurts Into Wholeness. Downers Grove, Illinois: InterVarsity Press. Venter, Alexander. 2009. Doing Healing: How to Minister God’s Kingdom in the Power of the Spirit. Cape Town, South Africa: Vineyard International Publishing. Williams, Don. 2006. Start Here: Kingdom Essentials for Christians. Ventura, California: Regal.